Hello, and thanks for visiting the Sparks K9 website! My name is John Sparks, owner, founder and certified lead trainer at Sparks K9, in Monroe, WA. I am also co-founder of Balanced Bullies Rescue and Rehabilitation (a 501c3 non-profit organization). My passion for dogs started from an early age; over the years I have been on a quest to learn and share as much as I can about the training, care and behavior of dogs. Whether you are looking for help with starting your puppy out on the right track, working with a "new" shelter or rescue dog, basic, intermediate or advanced obedience, protection sports, tracking/scent work, or aggression/reactivity issues, you've come to the right place! 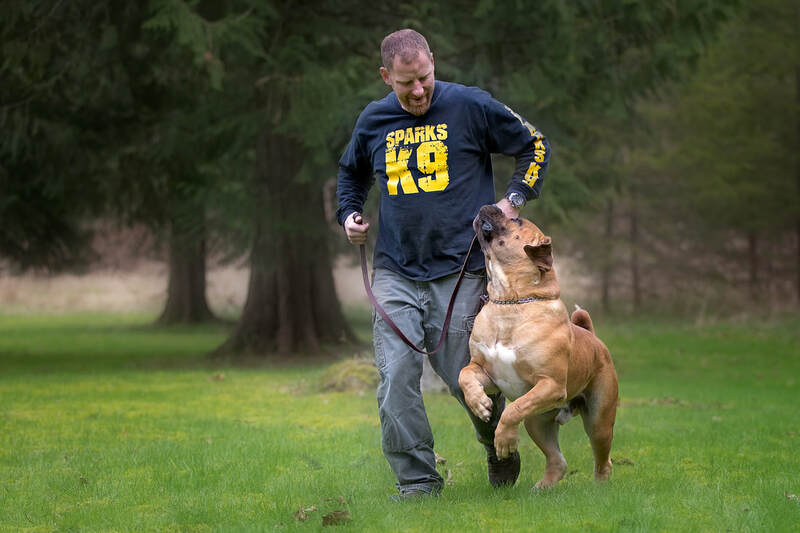 I am one of only a handful of trainers that will work with severely aggressive dogs; I've never turned down a request for help, nor have I met a dog "too aggressive" to rehabilitate. I've honed my techniques and skills through years of traveling around the country to learn from the best of the best in the industry, in addition to extensive hands-on experience and continuing education. Spending time learning in person from great dog trainers like Michael Ellis, Tony Ancheta (and others) has increased my knowledge and abilities on many levels. I am passionate about my work, and want to help you and your dog develop a safe, mutually beneficial relationship that will last. If you need dog training, dog aggression solutions, puppy training or just help with dog obedience or dog tricks, you've come to the right place! When not training dogs, one of my favorite hobbies is photography........if I don't have a leash in my hand, you will often see a camera! Kim is the bubbly voice you will usually hear when calling Sparks K9, and is often the one answering emails and scheduling appointments. She runs the office and keeps me organized and on track. Kim assists me at our group classes and shows up at quite a few private lessons. Kim also runs Balanced Bullies Rescue & Rehabilitation (our Pit Bull rescue), so she wears many hats around here! Kim has been learning to use my cameras, so is often tasked with shooting photographs during group classes and private lessons......one more hat! Sparks K9, founded by certified dog trainer John Sparks, is the premier dog training and rehabilitation service in the Puget Sound area. Sparks K9 is often the last stop for dog owners who have exhausted every other option and have still not found the help or results they need. Our unique and highly-effective training approaches consistently deliver results that surpass our clients’ expectations, creating the kind of happy and harmonious relationship that every dog owner dreams of. From the simplest behavior problem to the most severe aggression cases, we have yet to find a dog we could not help. We sincerely believe, and our results have consistently proven, that we can help you solve those tough dog issues that other trainers have not been able to handle or resolve. We at Sparks K9 believe that there should be standards of performance for pet/companion dogs. Having a well trained dog will allow you to fully enjoy your time together in all situations. After our Novice Obedience training course or our full service board and train program, your dog will be able to responsibly perform the following exercises: heel, come, sit, automatic sit, down, stand and stay - both on and off leash, in areas of reasonable distractions at home and away. "This man is truly amazing!! A soul who really understand all dogs, and gets them to remind immediately. This power couple can save the day!!!" - Janee' C.